I laid my trusted rifle across my lap and glanced at my watch. Almost half an hour of darkness remained before the sun would break the horizon on the first day of Pennsylvania rifle season. I waited, enjoying the cool and quiet dark as the time ticked away. The black of night turned to grey, and the shadows started to take shape. I caught movement in the brush. Through my binoculars, I saw the outline of the small yearling buck. This was not the buck I was looking for that morning, but the sighting spiked my adrenaline. Shortly after the young buck disappeared into the twisted laurel, I caught more movement as a group of does climbed cautiously up the mountain. Time slipped quietly past without my noticing. It could have been an hour or even three hours later when the glint of bright ivory antlers weaving through the brush gave a new buck away. My focus snapped tight as the adrenaline red-lined for the second time. Even through the thick tangle of saplings, I saw immediately that he was headed in my direction. As he moved closer, I could see the tall rack of this mature buck. He was locked onto a doe who wanted no part of his admiration. The doe and her admirer closed the distance between us, and I spotted two or three other bucks flanking the pair. Here I was, the right spot at the right time. Two of the satellite bucks, including a mature, dark-antlered eight-point, peeled off towards a clearing in the underbrush. This was my opportunity. As soon as the two bucks stepped into the opening, I eased off the safety. The crosshairs settled onto the crease behind the front shoulder of a heavy-racked, eight-point buck. The report of my rifle...and the buck collapsed within sight. It was my trusted bolt action rifle that made this hunt a success. But would this story of a beautiful Pennsylvania whitetail buck have changed had it been a semi-automatic? In fact, the very bullet that put the fresh venison on our table could have been fired from a semi-auto in nearly every state in the nation except the one where this buck lived. For some, this prohibition of semi-automatic rifles in my home state of Pennsylvania is a safety concern. 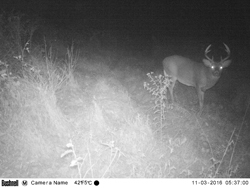 The Pennsylvania Game Commission researched this very issue. They found that the use of semi-automatic rifles in big game seasons in other states did not have an impact on hunter safety while afield. Yet even with this knowledge, there were still major hurdles to removing such a long-standing prohibition. In November, one of these was cleared as the governor of our state signed the critical piece of legislation. This bill permitted me and other hunters the opportunity to use semi-automatic rifles in Pennsylvania for all game species. Now, the final decision belonged to the Pennsylvania Game Commission. The stage was set for a monumental vote at the most recent meeting of the Pennsylvania Board of Game Commissioners, held the last week of March. The fate of semi-automatic rifles in hunting seasons came down to just their eight votes. There was room for optimism, and we eagerly anticipated the decision. The votes were cast, and despite all, Pennsylvania decided to remain one of the only states in the nation where a hunter cannot legally hunt big game with a semi-automatic rifle. As part of their ruling, the commissioners reported the reasoning for their vote. How convenient it would have been if it was the standard political gamesmanship between right and left behind it all. But instead, the prohibition on semi-auto hunting will continue thanks to the hunters themselves. According to the commissioners, the majority of Pennsylvania hunters in the poll they conducted made their voices clear. They were not ready for semi-automatic rifles in Pennsylvania big game seasons, which include black bear, elk, deer and turkeys. Yet, this much anticipated decision was only a partial loss, or partial victory, depending on your point of view. While my new JP wouldn't be coming with me for this year's whitetail season, it will still be more than just my 3-Gun rifle this year. While the commission's vote was not in favor of semi-automatic rifles for the big game seasons, it was not an outright ban on semi-auto hunting. As it turned out, this was a compromise since the commission's decision gave final approval for semi-auto hunting for small game, furbearers and groundhogs during the 2017-2018 hunting season. This is a first in Keystone State history. For hunters like me, it took some of the sting out of the decision and gave room for hope. What's more, the Game Commission noted that if there is increasing interest in the use of semi-automatic rifles in big game season, the decision could be revisited in future years. In the end, this wasn't a loss. In fact, it's just that we didn't win as much as we'd hoped this time around. So long as hunting remains popular in Pennsylvania, semi-automatics are a matter of when, not if. Pennsylvania may still be at the back of the pack, but we're all moving in the same direction. So for now, I will continue to carry my favorite bolt action rifle through the whitetail woods. But, as soon as the new regulations take effect on July 1, I will be on trigger of my JP-15. The fat groundhogs will be venturing out of their holes to feed on big green soybean leaves, and I'll be waiting. It'll be a nice change for this year and not the last, I'm sure. 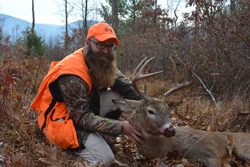 Garrett Boop is an educator and active hunter from Pennsylvania. Along with the other members of the Keystone Armory Shooting Team, he's also an active 3-Gunner and adrenaline junkie. You can see more of Garrett's successful buck hunt last fall on this episode of Midwest Whitetail East at the 7:50 mark. © 2017 JP Enterprises. All rights reserved.